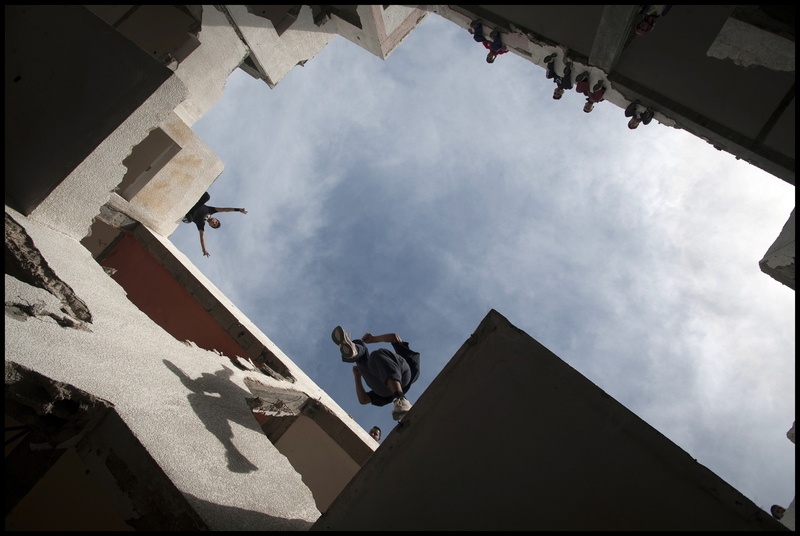 Craig Stennett Photojournalist | Parkour in the Gaza Strip. 18 year old Fahed Dawood is airbourne over the Gaza Strip, Beit Hanoun, Northern Gaza Strip. 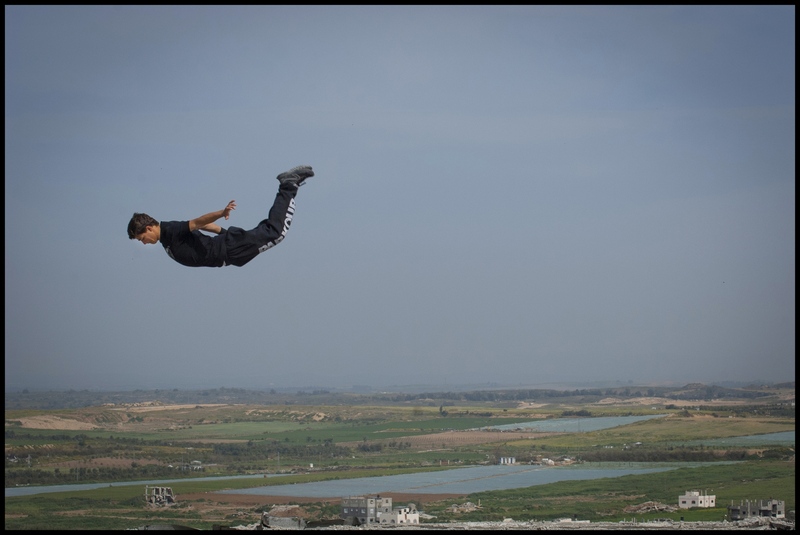 Fahed is a member of the Gazan Parkour team '3 Run Gaza'. 18 year old Fahed Dawood offers an opinion on his fellow team members criticism of him having to take a rest. Beit Hanoun, Northern Gaza Strip. 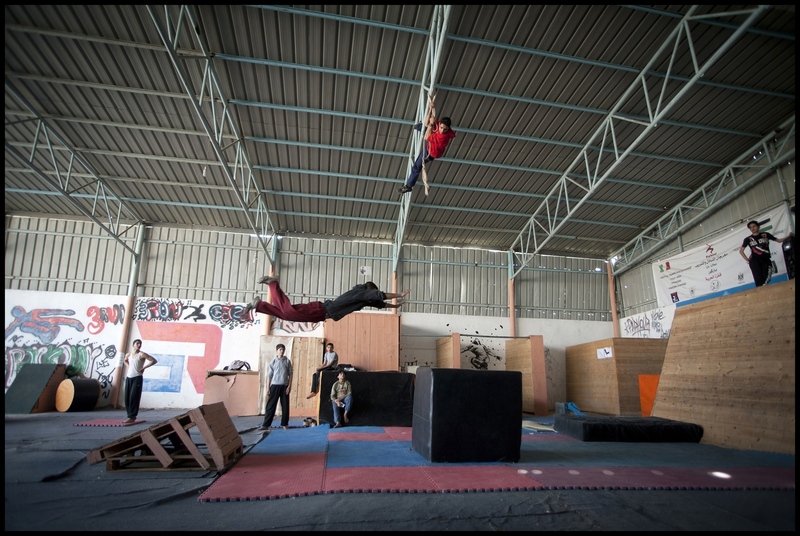 18 year old Fahed Dawood at his Parkour Teams main base off Saladin Road in Beit Hanoun, Norhern Gaza Strip. 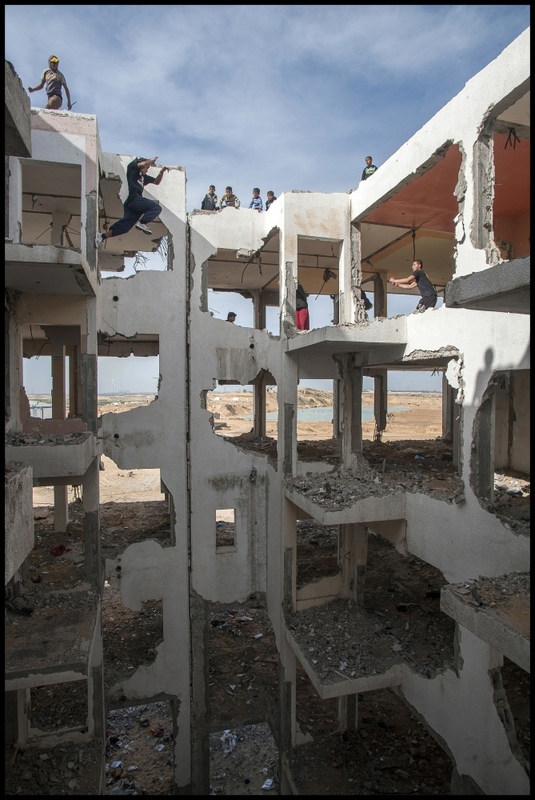 '3 Run Gaza' at the bombed out remains of a flat complex destroyed in 2014 during Israel's 'Operation Protective edge', Beit hanoun, Northern Gaza Strip. 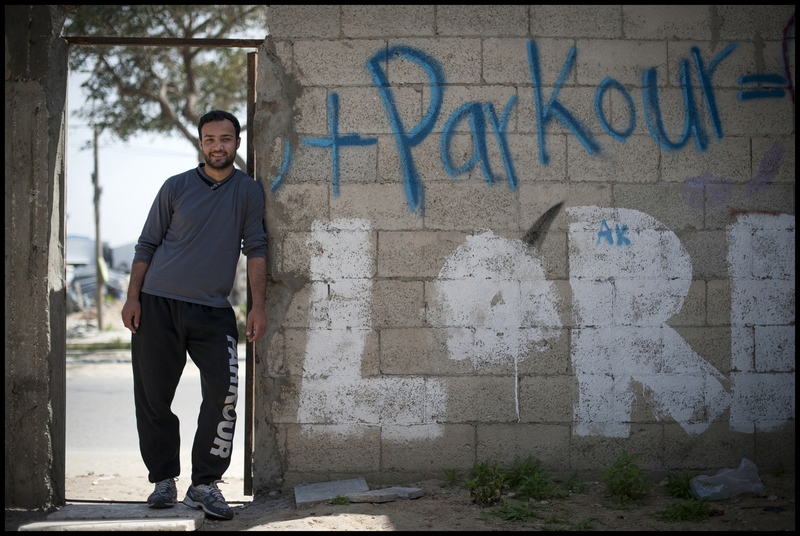 Uday Ajrami of '3 Run Gaza' at Beit Hanoun, Northern Gaza Strip. 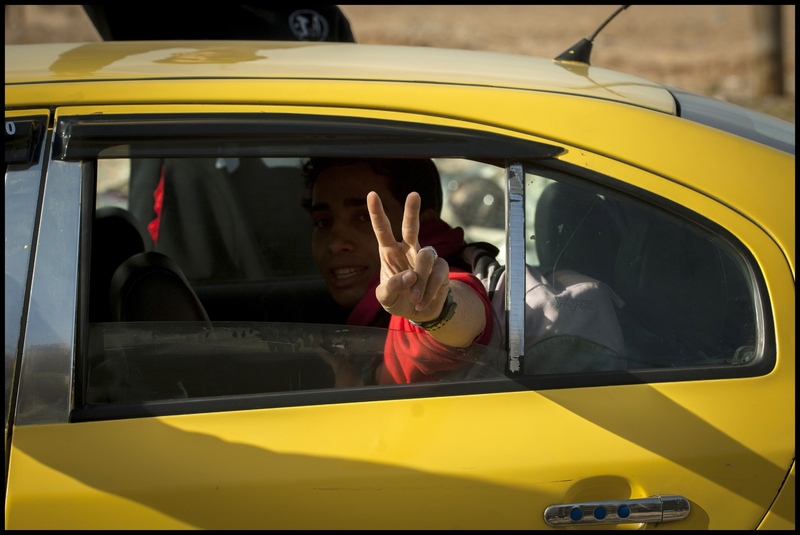 19 year old Essam Dahaman leave by Taxi Beit Hanoun, Northern Gaza Strip. 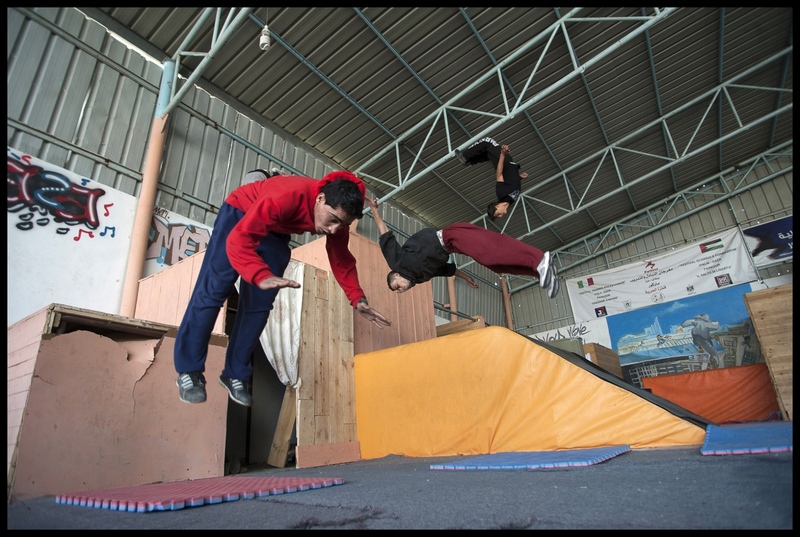 Essam is a member of the Gazan Parkour team '3 Run Gaza'. 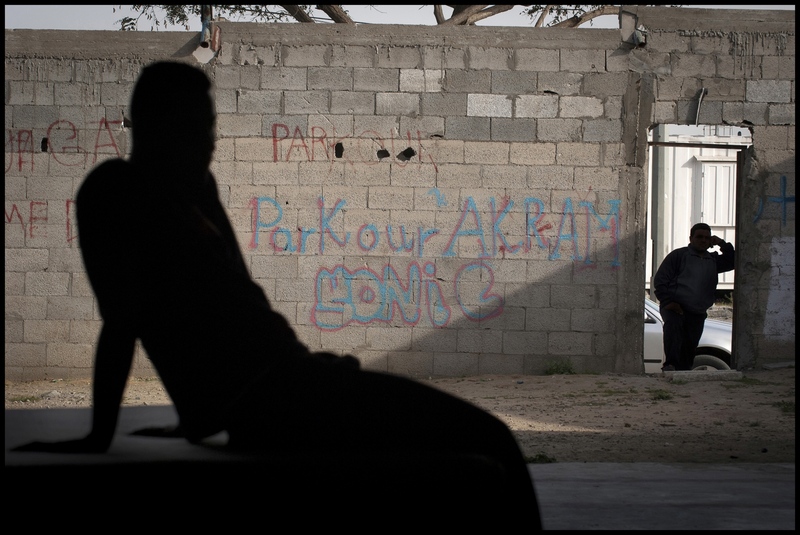 A passer by takes a look in at the door of the Parkour Teams centre while one of the '3 Run Gaza members,19 year old Saed Shaqura, takes a break. 16 year old Fahid Al Assi 'I want to feel freedom and be happy.' At the training home of '3 Run Gaza'. Based in Beit Hanoun, Gaza Strip. Parkour, derived from the French “parcours du combattant“ meaning a military obstacle course, can trace its lineage back to the turn of the 20th century. Originally pioneered by French Naval Officer Georges Hébert who during his time in Martinique coordinating a rescue operation he witnessed the native African peoples' exceptional athleticism and how they accomplished this by physically interacting with their surroundings. In 1905 Hébert published his book ‘La Methode Naturelle’ and his training technique has gone on to be significantly adopted and absorbed by much of the worlds Military. In its simplest form Parkour is the activity of moving efficiently and quickly through obstacles, navigating from point A to B by the shortest most direct route. However, its modern day version can be viewed as much as an art form as a physical discipline. Fast forward half a century and Raymond Belle enters on to the Parkour history scene. Belle, a former French Special Forces soldier, on returning to his hometown of Lisses bordering Paris he introduced his son David to the discipline of ‘parcours du combattant’ and the founding principals and teachings of Georges Hébert. It is David Belle who during the 1980’s and 90’s went on to combine the lessons from his father with his own proficiency in gymnastics and martial arts to give birth to modern day Parkour. 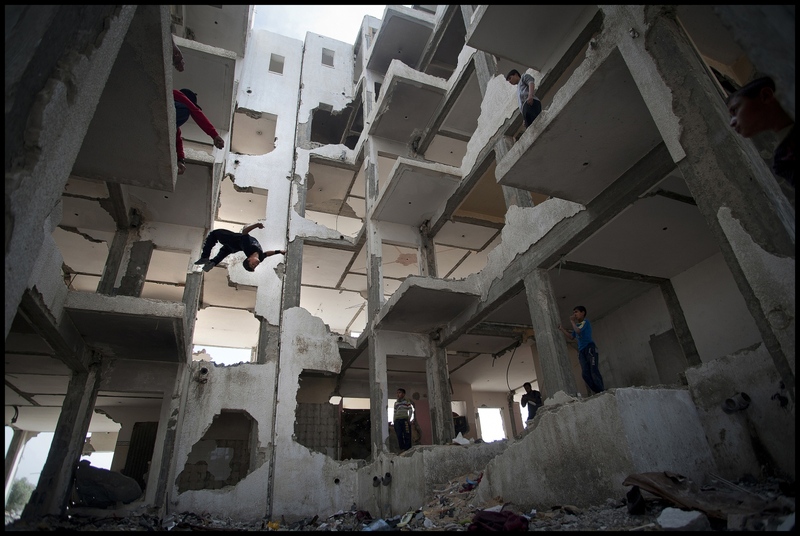 This is the home of the Parkour group ‘3 Run Gaza’. A core committed nucleus of around 20 individuals with an additional 100-affiliated members. Its 25-year-old Mohammad Lubad who manages and coaches the group: ”My background is in gymnastics but after seeing the film District B-13 (2004 French action adventure movie featuring Parkour and often sighted as introducing the discipline to a wider audience) I knew I wanted to learn to do these moves. So I started to copy them from the film and became more interested in Parkour and established the club.” Mohammad is just about audible while he describes his journey into Parkour above a barrage of sound as techno music spills out of two huge speakers positioned within ‘3 Run Gaza’s’ training centre near Beit Hanoun in the Northern area of the Strip. The group have had their headquarters there for around 10 months. Raising funds from shows and commercials alongside the awarding of discretionary grants. This has enabled them to establish their own home base for practice. 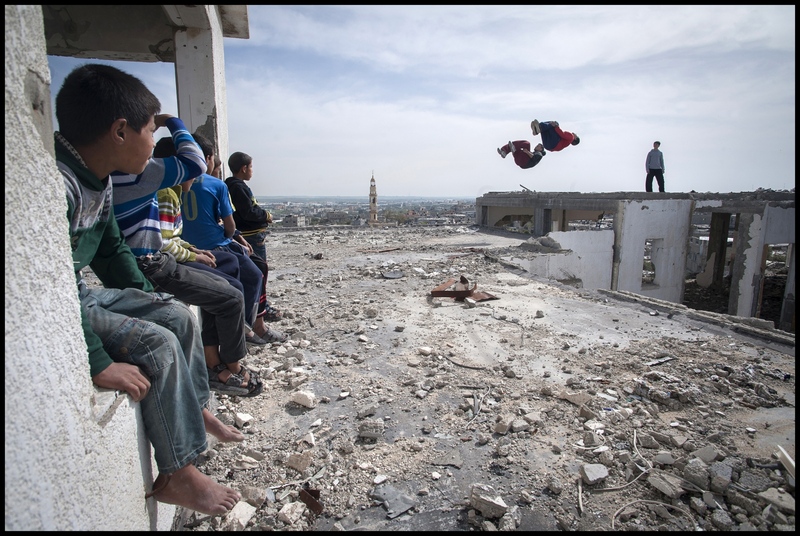 The Parkour practitioners of Gaza have, thankfully, had an easier run at acceptance by the broader community and its inherent conservative Psyche than their ‘cousin’ Breakdancers. The gymnastic element of Parkour seems to be the deciding factor in this. The Strips authorities, Hamas, have largely embraced their sport and the benefits it brings. 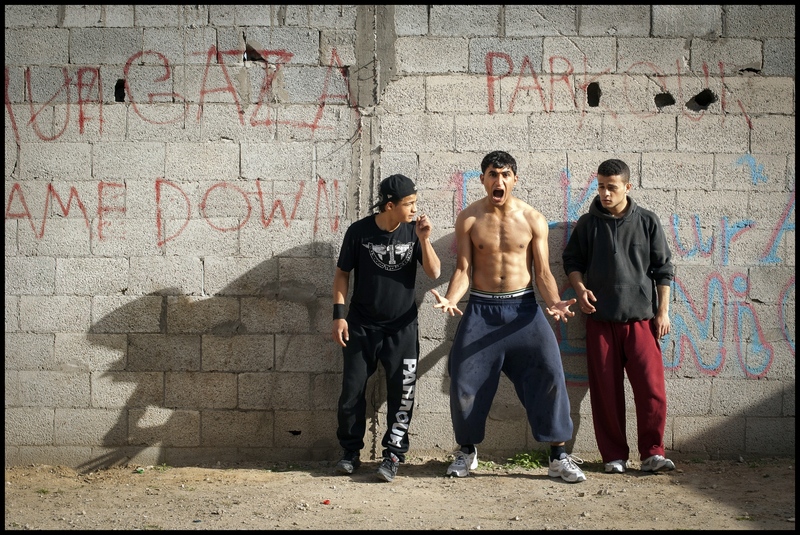 Where as Breakdancing, which also flourishes with in Gaza, has had an uphill struggle with its familiarity in the use of western rap music and the distinctly different ‘badge’ clothing that’s worn. 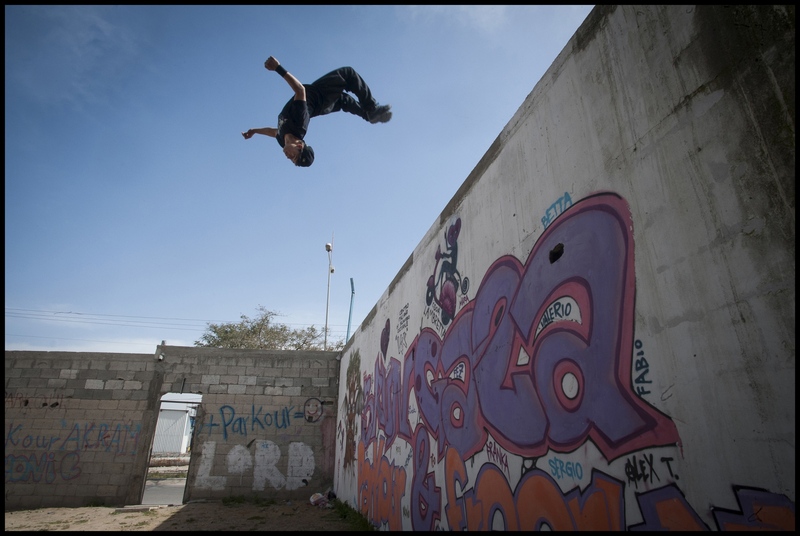 17 year old Mohammed Hennawy acknowledges that: “ Its still rare to see someone doing Parkour in Gaza.” However, the urban landscape of the strip with its war shattered buildings have become a Parkour and Freerunners playground. 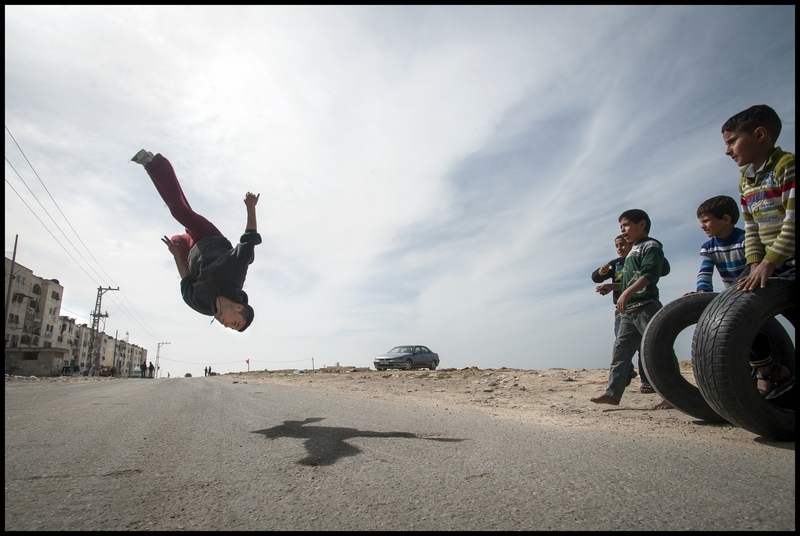 As a sport that is concentrated on overcoming obstacles it is probably one of the most appropriate disciplines to embrace for the 70% of Gaza’s population that is under the age of 25. 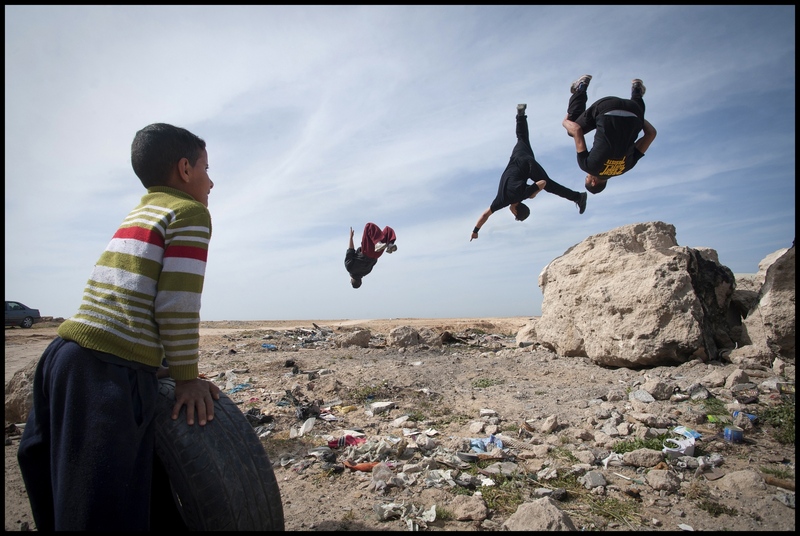 Obstacle’s, in a myriad of forms, is daily life in the Strip and an ability to master them is critical to not only ones own survival but also the larger Palestinian community itself.